Welcome to Graduate Studies in Family Medicine at Western University. The Department of Family Medicine at the Schulich School of Medicine & Dentistry offers both a Master of Clinical Science and a Doctor of Philosophy in Family Medicine. Since 1977, the Department of Family Medicine at Western University has offered a program leading to the degree of Master of Clinical Science in Family Medicine (MClSc). The program attracts family physicians from across Canada and around the world looking to enhance their knowledge, skills and leadership within the discipline of Family Medicine. In 2008, the first PhD in Family Medicine in North America was launched at Western University. This degree attracts family physicians anticipating a research career in Family Medicine. Combining on-site learning with distance education via the Internet, both programs are available on a full or part-time basis and utilize the broad range of academic and research expertise of the faculty. To download our Master of Clinical Science brochure click here. To download our PhD brochure click here. The Master of Clinical Science program attracts Family Physicians from Canada and around the world who wish to enhance their knowledge, skills, and leadership within the discipline of Family Medicine. This program combines on-site (two weeks, once yearly) with distance education via the Internet. The course of study is designed to fit the needs of the individual student and utilizes the broad range of academic and research expertise of the faculty. The program is offered as both a part-time and a full-time program. 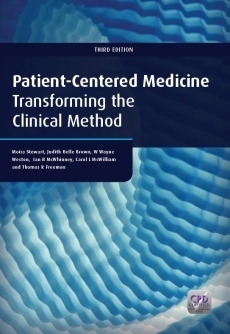 3rd Edition of Patient-Centered Medicine Textbook now available! This long awaited 3rd edition fully illuminates the patient-centered model of medicine, continuing to provide the foundation for the Patient-Centered Care series. It redefines the principles underpinning the patient-centered method using four major components – clarifying its evolution and consequent development – to bring the reader fully up-to-date.